The word “when” has multiple functions. It can be used as an adverb, conjunction, pronoun, and noun. Sunday is the day when I get my hair done. The word “when” is used to denote the time (Sunday) when the verb is performed. When did you last see Carlo? Raise your hand when you’re finished. a. at or during the time that. I loved math when I was in middle school. She had just drifted off to sleep when the doorbell buzzed. I’m saying it now, when I should have told you long ago. 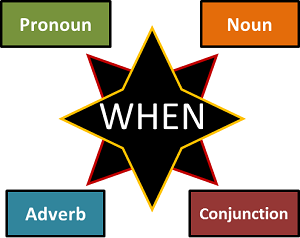 The word “when” is considered as a pronoun because it represents the unknown time when the report is needed. I have lived here, since when I was born. He is troubled by the how and when of life. The confusion is over the when of the statement.